Introduction: Oil pulling as described in ancient Ayurveda involves the use of edible vegetable oils as oral antibacterial agents. It is a practice of swishing oil in the mouth for oral and systemic health benefits. Pure coconut oil has antimicrobial properties and is commonly available in all Indian households. Aim: This study aims to assess the effect of oil pulling therapy with pure coconut oil on Streptococcus mutans count and to compare its efficacy against sesame oil and saline. Materials and Methods: A randomized controlled concurrent parallel- triple blinded clinical trial was conducted. Thirty participants in age range of 20–23 years were randomly allocated into Group A (coconut oil), Group B (sesame oil), and Group C (saline), with 10 in each group. The participants were instructed to swish and pull 10 ml of oil on empty stomach, early morning for 10–15 min. Unstimulated saliva collected before and after oil pulling procedure was analyzed for colony forming units (CFU) per ml saliva of S. mutans. The data were analyzed using paired t-test, ANOVA, and post hoc analysis using Tukey's honest significant difference. Statistical significance was set at P < 0.05. Results: A statistically significant reduction in S. mutans CFU count after oil pulling with pure coconut oil (P = 0.001) was found. There was no statistically significant difference between sesame oil and coconut oil (P = 0.97) and between sesame oil and saline (P = 0.061). 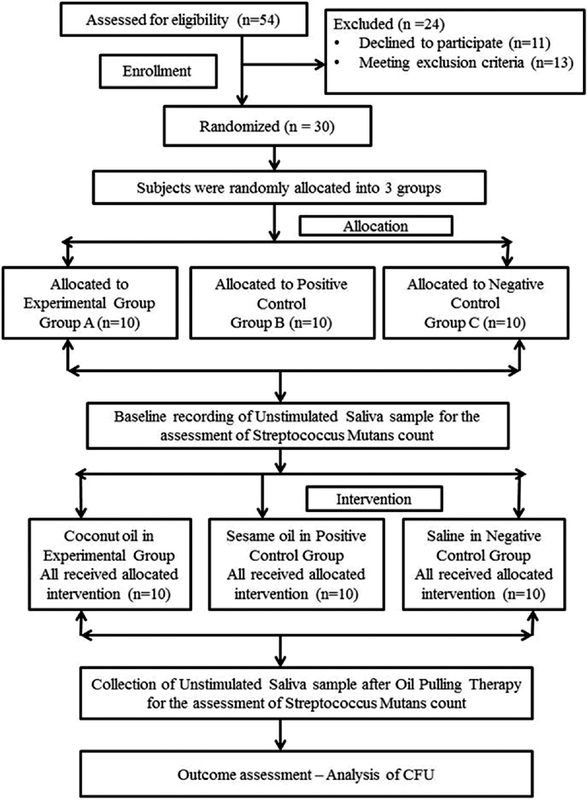 When efficacy of coconut oil against saline was evaluated, a statistical significant difference (P = 0.039) was found. Conclusion: Oil pulling is an effective method for oral hygiene maintenance as it significantly reduces S. mutans count in the saliva. Introduction: Streptococcus mutans infection has been identified as an important microbial factor for early childhood caries (ECC). Candida species has been shown to enhance the adherence of S. mutans to the oral biofilm and carious tooth substance. However, there is a paucity of the literature regarding the association between S. mutans and Candida albicans related to the ECC. Aim: To assess and compare the levels of S. mutans and C. albicans among 3–5-year-old preschool children with and without ECC and to determine the association between them. Materials and Methods: A cross-sectional study was conducted among 30 children with ECC (ECC group) and 30 children without ECC (non-ECC group). Dental caries was assessed, and unstimulated saliva samples were collected. 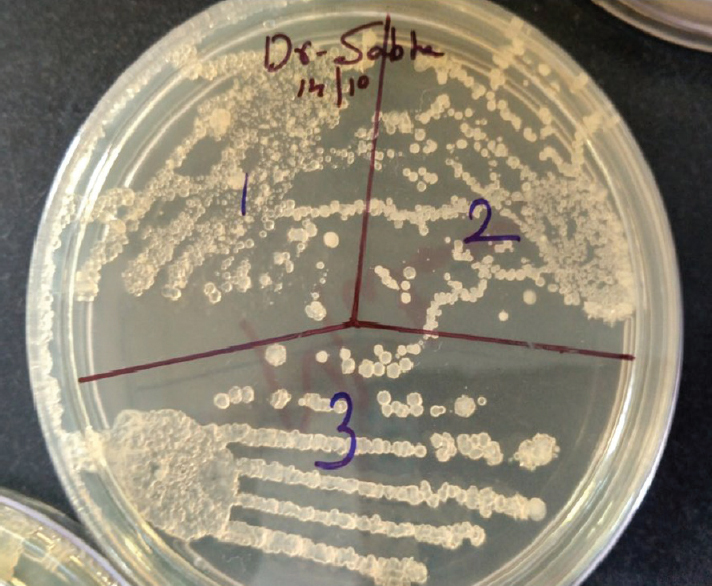 S. mutans and C. albicans counts were determined using Mutans-Sanguis agar and CHROMagar, respectively. Chi-square test and logistic regression were used. Significance levels were set at 5%. Results: There was a significant difference between ECC group and non-ECC group for S. mutans (P = 0.04) and C. albicans (P = 0.02) levels. There was no significant association between S. mutans and C. albicans in ECC and non-ECC groups. Children with ECC were more likely to have high levels of S. mutans and C. albicans when compared to non-ECC group. Conclusion: Children with ECC presented higher levels of S. mutans and C. albicans compared to children without ECC. High affinity between S. mutans and C. albicans suggests interaction between these diverse species that may mediate cariogenic development. Background: The number of people with diabetes is increasing globally. Undiagnosed diabetes may be present in number of people having periodontitis. Self-monitoring devices, although useful, require a needle puncture. Aim: The aim of this study was to establish whether gingival crevicular blood (GCB) can be used as a noninvasive diagnostic aid in screening for diabetes mellitus during routine periodontal examination. 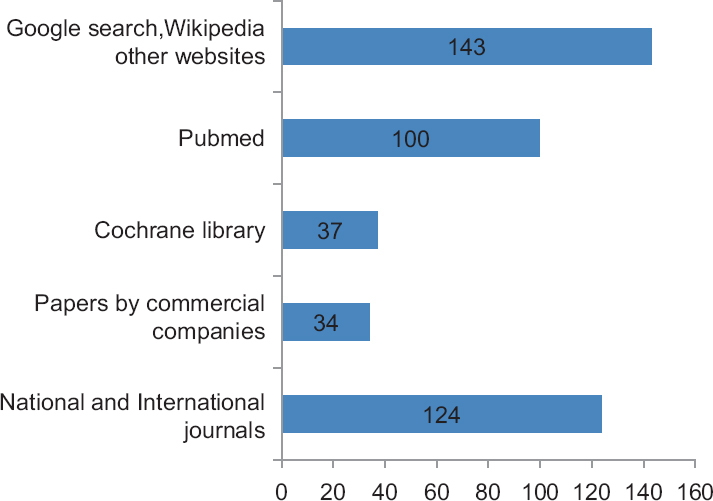 Materials and Methods: The study involved sixty patients based on convenient sampling methodology. Probing depth, bleeding on probing (BOP), gingival bleeding index, and periodontal disease index were recorded. The GCB oozing out of the sites with positive BOP was collected. The capillary finger blood was collected from the pad of the finger. Both the samples were analyzed using a readily available portable blood sugar monitoring device. The data were analyzed using Karl's Pearson's correlation and Student's t-test. Results: GCB glucose levels ranged from 66 to 216 mg/dl with a mean of 137.15 ± 18.36 mg/dl as compared to the finger-prick blood glucose levels which ranged from 86 to 248 mg/dl with a mean of 134.24 ± 16.45 mg/dl. A Pearson's correlation coefficient between the GCB glucose levels and the capillary finger-prick glucose levels showed a very strong correlation with an r = 0.94. Conclusion: The data from this study have shown that GCB collected during diagnostic periodontal examination could be an excellent source of blood for glucometric analysis. Introduction: Oral health is an integral part of overall health. Very little information is available on the status of dental caries status of children in Goa state. Aim: The aim of this study is to assess the dental caries status and treatment needs of government primary school children in Goa. Materials and Methods: This cross-sectional, descriptive study was conducted among 6–12 years old government primary school children using the WHO survey methodology 1997. Multistage probability cluster sampling technique was adopted to obtain proportional sample from 11 talukas of Goa. Descriptive statistics was calculated, and t-test was used for group comparisons. Results: The overall caries prevalence in primary dentition was 65.52%, with mean decayed, missing, and filled teeth (dmft) of 5.21 ± 1.81 for North Goa, and 5.28 ± 1.93 for South Goa district. Caries prevalence in the permanent dentition was 56.6% with mean DMFT of 3.89 ± 1.14 for North Goa and 4.12 ± 1.74 for South Goa district. Males aged 9 and 11 years exhibited statistically significant higher caries prevalence in primary dentition than females, while females aged 6 years exhibited higher caries prevalence than male children in permanent dentition but both groups exhibited high proportion of treatment needs. Conclusions: Dental caries was high in Goan children. Dental caries was found to be a significant health issue in child population requiring immediate attention. The provision of oral health education and school-based preventive programs seem to be a viable alternative to tackle overwhelming the burden of dental caries and other oral diseases. Introduction: There is an increasing recognition that children's oral health-related quality of life (OHRQoL) is affected by social and environmental factors. Aim: To assess the influence of socioeconomic status and home environment factors on OHRQoL among 13–14-year-old schoolchildren in North Bengaluru. Materials and Methods: This cross-sectional study was conducted among 800 children aged 13–14 years from government and private schools in North Bengaluru. OHRQoL was assessed using a shorter version of Child Perceptions Questionnaire (CPQ11-14). Socioeconomic status of children was measured using Kuppuswamy's scale. Children were also asked to provide information on home environmental factors. Descriptive, Chi-square, and Mann–Whitney U-tests were used to analyze data. Results: In both government and private schools, mean CPQ11-14 scores were highest for children belonging to upper lower class followed by the lower middle, upper middle, and upper class of socioeconomic status, showing statistically significant differences (P < 0.05). In government schools, children living with single parent/guardian, having two or more siblings, one or two rooms, staying with more than one person per room, family using alcohol/tobacco reported higher mean CPQ11-14 scores as compared to private schools. (P < 0.05). Conclusion: It is important to shift focus from the current biomedical and restricted paradigm on oral health and develop oral health policies and programs considering the socioeconomic status and home environmental factors in improving child OHRQoL outcomes. Introduction: Dental profession saw unprecedented change during the last century. Worldwide, patients have become more aware of their right-legal literacy including India. 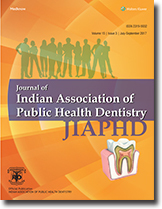 Aim: The aim of this study was to assess the awareness of the Consumer Protection Act, practice of informed consent (IC), and the utilization of dental indemnity insurance among dental practitioners in Bengaluru city. Materials and Methods: This cross-sectional study was carried out among 310 dental practitioners in Bengaluru city. A prevalidated self-administered 30-item questionnaire was to assess the awareness about the Consumer Protection Act (CPA), knowledge and practice of IC, and utilization of professional indemnity insurance among practicing dentists. Results: There was an equal distribution between both the genders in the study. A total of 67% of the study participants were aware about CPA and only 50% of the participants responded that they had a practice of taking IC for every patient. Only 35% of participants had dental indemnity insurance. Age and qualification positively correlated with awareness of the CPA (P = 0.007); utilization of professional indemnity insurance is also associated with years of practice (P = 0.002). Conclusion: Majority had awareness regarding CPA but practice of taking consent and utilization of professional indemnity insurance among dental practitioners were less than adequate. Introduction: Dentistry has for some time been viewed as a profession with high-stress, and usually this begins from the days of dental school onward. Students are subjected to different kinds of stressors, some being the pressure from academics with an obligation to succeed, uncertainty regarding their future and difficulties of integrating into the system. Aim: The aim is to identify the perceived sources of stress among postgraduate students from a dental college in Coorg, Karnataka. Materials and Methods: A cross-sectional questionnaire study was carried out, and the study samples included all the postgraduates of all nine specialties, including all the seventy-seven postgraduate students as samples. Results: Stress was relatively general among all the groups of the study participants, certain factors or stressors such as the amount of assigned work, competition with peers, examination and grades, lack of confidence to be a successful student and fear of facing parents after failure hamper the academic life of these students and had more significance among groups when compared to others. Conclusion: The academic life of students seemed to be hampered due to various potential stressors such as the amount of assigned work, competition with peers, examination and grades, lack of confidence to be a successful student, and fear of facing parents after failure. Such issues that arise in the educational setting need to be addressed which will help improve the academic environment of the students. Introduction: The impression Public Health Dentistry (PHD) has created on the undergraduate dental students, which is evident from the disinterest shown toward the specialty in pursuing postgraduation is disheartening. Aim: The aim of this study is to quantify the relative difficulty of PHD compared to all other subjects in the final year undergraduate dental curriculum and to qualitatively analyze different aspects relating to the subject from students' perspective. Materials and Methods: This cross-sectional study involved collection of secondary data in the form of final year mark lists obtained from Dr. NTR University of Health Sciences' website. Mark lists of students appeared for final BDS examinations during February-March, 2016 and August 2016 were available and included in the study. The quantitative analysis was followed by administration of a semi-structured questionnaire to 246 house surgeons from three dental institutions in the state of Andhra Pradesh. Subject Pairs Analysis (SPA) was performed to quantify the relative difficulty of PHD, while Mann–Whitney U-test and Chi-square tests were performed to check the differences in relative difficulty scores, students' attitudes, respectively, based on student's gender, type of college, and availability of postgraduation in PHD in the respective colleges. Results: SPA revealed that only orthodontics and pedodontics were relatively easier compared to PHD, while all other subjects in the final year curriculum were relatively difficult. However, contrary to the quantitative results obtained, PHD was reported as the most difficult subject by 31% of the study participants. Differences were due to gender and availability of postgraduation in the specialty. Conclusion: There is a need to adopt new strategies in making the subject more interesting and understandable for students. Introduction: Dental care for chronically ill and nonambulatory patients has an impact on the clinical outcomes and well-being. Poor oral care can result in nutritional deficiency, infections and can have an adverse effect on quality of life. Hence, oral hygiene of these patients is a basic responsibility of nurses. 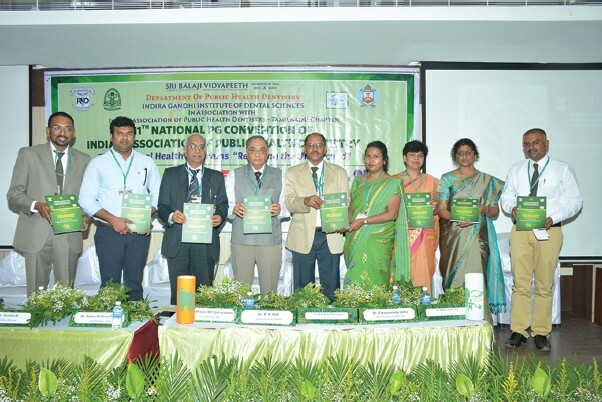 Aim: This study aims to assess the attitudes and practices among nurses regarding the oral health care of nonambulatory patients in hospitals of Warangal city, Telangana. 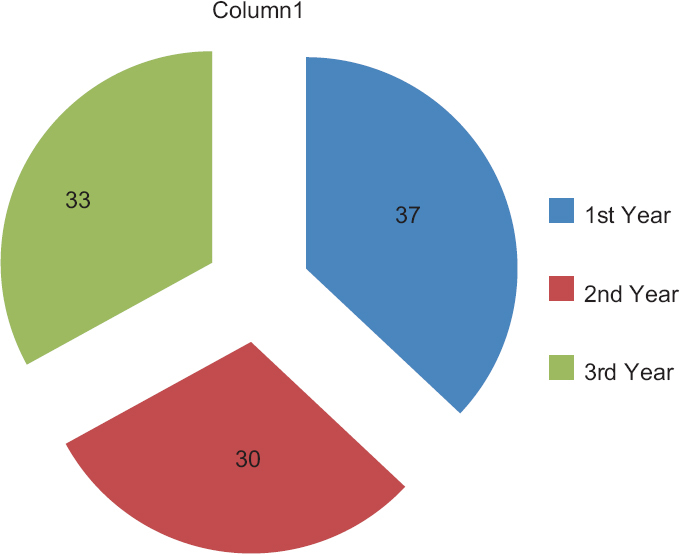 Materials and Methods: A descriptive cross-sectional study was conducted at five private and one government hospitals of Warangal city, Telangana. Data were collected among 208 nurses using pretested self-administered questionnaire regarding attitude and practices of nurses toward oral health care of nonambulatory patients. Responses were coded and analyzed using Statistical Package for the Social Sciences version 20. Results: Majority of the nurses (45.2%) stated that trained nurses carry out the oral care in wards. About 53.8% nurses reported that uncooperative patients hinder them in performing oral care, 47% considered cleaning the oral cavity of the patients as an unpleasant task, and 70.2% nurses felt that checking the oral cavity and its status of the patient is their responsibility. Conclusion: Practices and attitudes of nurses on oral health care toward nonambulatory patients are found to be satisfactory. Introduction: Teeth play various functional and esthetic roles. As any part of the body, even teeth loss gives one the feeling of being handicapped showing a negative impact on emotions. Sometimes, few people think that having 32 teeth and losing a few among them will not make a difference. Aim: To assess and compare the emotional effects due to loss of natural teeth in complete denture wearers and nondenture wearers. Materials and Methods: A hospital-based survey was conducted on complete denture wearers and nondenture wearers who were attending the outpatient department in a dental hospital for 2 months using a pretested, self-administered questionnaire. Results: Among them who were surveyed, 65.75% agreed accepting the tooth loss is difficult, only 30.13% felt that loss of teeth affected their self-confidence (P = 0.094), about 80.82% reported that natural teeth loss affected their eating efficiency, and 57.53% of them found it difficult while speaking to others. There was a significant difference between denture wearers and nondenture wearers when asked whether loss of teeth affected their looks, eating efficiency, and speaking difficulties (P = 0.000). Conclusion: Even though the majority of them found it difficult in accepting tooth loss, it did not affect their self-confidence majorly; however, most of them found functional difficulties with loss of natural teeth. Introduction: Oral health has long been recognized as an integral part of general health. The trend indicates an increase in oral health problems in developing countries like India. When it comes to rural population, a multitude of challenges prevail pertaining to the betterment of oral health care. Aim: To determine the oral health care-seeking behaviors in rural Andhra Pradesh and to identify the influencing factors. Materials and Methods: A cross-sectional study was conducted among 18 years and above population using a structured pretested questionnaire. A total of 2711 subjects were selected using stratified proportionate random sampling technique. Data were analyzed by SPSS version 20 software. Percentages of the categorical variables were computed and compared by Chi-square test at 5% level of significance. Logistic regression was used to determine the influence of sociodemographic variables and oral health needs on the utilization of oral health-care services. Results: Of 2711 subjects, 1144 have experienced previous dental problems, toothache being the most experienced dental problem (46.32%) and the common treatment underwent was extraction. Most preferred treatment center by the study subjects were private dental college, and reason identified was accessibility which constituted about 44.5% of all the reasons. Most common reason for not visiting the dentist was the poor attitude of the subjects toward the dental problems as it constituted about 43.75% of the total influencing factors. Conclusion: Poor attitudes on the importance of oral health were quite evident, and efforts must be made to bring a change in this scenario. Introduction: The decision toward dental implant – an elective procedure in most cases depends on patients' preferences, values, as well as cost considerations. Patients' participation and codetermination, as well as realistic patient expectations, have been associated with improved subjective treatment outcomes, and health professionals are increasingly encouraged to involve their patients in treatment decisions. However, scientific data on patient expectations and motivation to choose or refuse dental implants are scarce. Aim: The aim of this study is to assess perception about the dental implant and bone graft surgery among patients seeking dental implants. Materials and Methods: A cross-sectional questionnaire study was carried out in OPD of Dental College, Aligarh. One hundred and twenty patients participated in this study. The patients were asked to answer a questionnaire on implant and bone graft surgery including cost and time concerns and second-opinion behavior. Descriptive statistics were calculated for the different variables, and absolute frequencies and percentages were evaluated. A value of P< 0.05 was selected as the threshold for statistical significance. Results: The highest priority was given to treatment predictability and avoidance of the removable dentures by the patients. On an average, the total treatment time was estimated to be 6 months. Patients' opinion regarding 10-year implant success rate was 81%. Autologous bone grafts was accepted by 61% of interviewees (the majority preferring the retromolar area). Young patients, especially males showed higher second opinion-seeking behavior. Conclusions: There is a growing interest in patients' perspectives and expectations of dental implants and bone graft surgeries. Patient expectations on implant success and predictability were found to be high.